I love MAC lip pencils, because they are so versatile and they have a really nice creamy texture that makes hen very comfortable to wear. However, I'm not a huge fan of the price. This past fall, dark, vampy lips were everywhere and one lip product popping up everywhere was MAC'S Nightmoth lip pencil. It's a gorgeous blackened purple pencil and it retails for $15 in the US or £11.50 in the UK. While going through my stash I found a great dupe and decided to share it with you guys. It's called the Twist Up Lip Liner in Deep Cherry by Sleek Makeup and it retails for $3.49 on sleekmakup.com and I believe they are also sold at Superdrug in the UK.I can't remember how much it costs in Nigeria, but it can't be more than 500 NGN (not too sure). 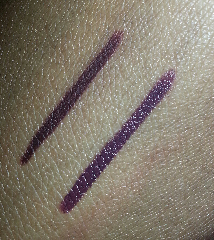 On the left is MAC's Nightmoth awhile the one on the right is Sleek's Deep Cherry. There's hardly any difference between the two colors. If anything, the Deep Cherry is creamier, which means it might not last as long. But for the price, personally, I don't mind at all. So what deep purple liners do you guys love? I'd love to know.